Aroma: Biscuity and toasty malt aroma. Light citric hop note settles in. A good bready base to support the hops. Appearance: Cloudy amber with golden edges. Sticky white head that clings to the tumbler. Flavor: Good bready, biscuity malt flavors with a lemon rind citric hop note to balance. Finish is clean and bone dry. Mouthfeel: Medium bodied with medium carbonation. No astringency or alcohol heat detected. Overall impression: A highly balanced, highly drinkable Amber Ale. Probably the classic West Coast version of the style. Recommended. 22oz bomber, served in a pint glass. A - cloudy, red/brown color with a fluffy tan head that stayed as a layer, leaving a good deal of lacing. S - somewhat sour/bitter hop aroma with some malt aroma in the background. T - bitter hop bite upfront, some malt sweetness in the middle, followed with a bittering finish. D - it's better than some amber ales, but far from the best. Bottle courtesy of ZorPrime, 12oz into a pint glass. Thanks again Eric. Pours a medium-dark golden brown, with a few fingers of yellowish/off white head. Sticky lace and a nice layer of head is retained. Nose is full of hops, lots of citrus and grapefruit and the toffee notes from the malts stand out real well. Some lighter tropical fruits make their way in there too. Some drying, grassy notes also. Decent in taste as well, citrus notes aren't as prominent but work with the toffee malt which stands out here. Highly carbonated, and feels fairly watery; dry finish with lingering bitterness. Reasonable drinkability, although I'm not sure I'd pursue it on my own. Decent effort, nice to try. poured into a pint glass from a 12 oz bottle. poured a dark hazy amber color with a nice tan head with decent retention. smells of mild sweet malts and slightly hoppy. has a good malt flavor with a slight sweetness and a well balanced hop bitterness. mouthfeel is medium bodied, very smooth and lightly carbonated. drinkability is very good, a very refreshing enjoyable beer. Appearance is a slightly hazy medium red with a creamy off white head. Piny hops dominate the aroma with some nice spicy malt coming in underneath. Almost has a little rye character. Pine and a little citrus are early flavors followed by a nice spicy malt. A little toasted caramel is there as well along with a moderate bitterness to balance out the malty sweetness. An above average red ale although not spectacular. A solid beer I would have again. Beautiful brownish red the color of strawberry jam. Beautiful, slightly cloudy, and just great. Excellent lacing. Luminescent and amazing. I'm a fan. Colour is outstanding. Really lovely American hop nose, fresh and pleasant, lots of amarillo and cascade. Redolent with the really wonderful American characters. I love it. Lots of bitter-to-sour characters on the palate, very smooth, but with masses of delicious in-your-face American hop bitterness. It's not terribly complex, but it's tasty as hell. Clean and so American - I cannot express how much I love that character in my beer. Drinkabkle and delectable. I really like this beer; a really good American hopped ale. It was a perfect way to end my evening of American beery goodness. 7 oz bottle into a ½ pint glass. Pours a deep, somewhat murky, rosy colored amber with a ¾ finger head of light mocha foam. This retains with a rich creaminess which throws up a robust cascade of lacing. The aroma is leafy, citric, and a touch spicy, with a pronounced roasted smokiness going on with it. Some caramel malt mingles in to add a touch of sweetness to the proceedings. The taste is a balanced mix of bitter citrus and sticky feeling caramel malts, before heading into a dark backend of deep toasted grains. Leftover sweet sugars, fruit, and dry bitter rind linger in the finish. The mouthfeel is medium bodied, and is a little sharper up front on the tongue, before spreading out into the mouth with a smooth creaminess. This was a solid take on a Red Ale from Rogue, and I liked that this focused a bit more on the roasted character of the malts than their regular American Amber Ale does. The hops didn’t quite assert themselves like I would have expected but then again, I’m not quite sure of the age of this bottle. I still liked what I found here though and would definitely try this on draft if I saw it. smells of spiced fruit, grapes,citrus,berries. tastes of hops malt fruit citrus and black berries. very light in the mouth with medium carbonation but with fine bubbles . a good desert beer i would with pie/cobbler that contain berries. i must say this beer is done in a sophisticated manner, will purchase again. Eye Candy: poured a beautiful dark red, more on the brown/garnett side of the fence. 2 finger pure white head that lingered. Excellent lacing present. Magical in the light. Ahhh, another pretty beer. Skunky says: Smelled sweet, maybe a tad on the honey side. Very pleasant indeed, not overpowering, but in comparison to other reds, just a medium. Tongueland: Crisp and sweet. Malts really came out, mixed with sweetness comparable to honey. As warmed, caramel and hops emerged, competing for playing time. The alcohol slightly emerged in a warming sense as I progressed and this was a welcoming feeling. Delectable, but not as good as Aviator Red from Flying Bison, Buffalo, NY. Thanks to Robert for giving me a bottle of this to try - wondering how it stacks up to Nugget Nectar. 12oz bottle with no best before date, served in my Surly pint glass. A - 2.5 fingers of orange-white head that dissipatesrelatively quickly but leaves very attractive lace patterns. Mostly opaque copper-red-orange color. S - A touch of citrus and floral hops and a hefty dose of toffee malts. There's also a substantial undercurrent of yeast and biscuit. I expected more from the dry-hopping. T - Definitely more hop flavor in the taste - lots of grapefruit - with a touch of residual bitterness. The sweet malt flavors are still there, but this is substantially more balanced. M - Medium body, moderate carbonation, nice residual oily resins. Very creamy, smooth, and refreshing. The mouthfeel is probably the best thing about this brew. D - At 5.1%, with reasonable carbonation, low bitterness, and a great mouthfeel this is a pretty terrific session brew. It's not Nugget Nectar, but it's a solid Red Ale. A- Amber ale that definitley has an amber hue with slight reddish tints two fingers head with nice retention and nice lacing. S-It is all over the place really. Grains,Citrus hops,Floral hops, earthiness, woodiness, roasted malts all fighting for the forefront. T-despite the nose the palate is not well balanced at all it's like a free for all in my mouth. I expected alot more from this after the nose. M-crisp, effervescent and a tad drying. D-Rogue ales are a tad on the expensive side here in New York and I have yet to find one to justify forking over the extra dough. I guess i keep doing it so I will have it in my frame of reference when judging other brews but this is definitely not one i would look to first. Auburn, maple-mahogany in color. Creamy, off-white head that recedes to a whispy sheet. A few trails of lacing. Semi-sweet, caramel toasted malts. Hazlenut and creamy, freshly roasted coffee. Fresh, floral hops; mild earthy tones. Creamy caramel; toasted hazlenuts and coffee beans, a touch of toffee. Earthy, floral hop character; a touch of pine. Remarkably well balanced. A gritty, husky bitterness followed by a creamy coffee aftertaste. Medium bodied; well rounded and full. Creamy and smooth on the palate. A boring style that really comes to life in this offering. Good flavors, nicely balanced, and highly drinkable = an old standby. A typically solid product from the 'Brewers on the Bay'. Color is a beautiful clear mahogany, and head is fairly thick if not too persistent. Aroma is strong and richly hoppy, though not "evergreen-ish." Flavor is delightfully hoppy and only a little bitter, with nutty and fruity hints and even a touch of smoke. Texture is exceptionally smooth so it goes down very pleasantly. Another winner from Rogue. he Rogue Dry Hopped St. 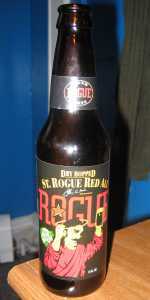 Rogue Red Ale is an interesting blend of a hoppy pale ale with a red ale. The dark red, lightly cloudy beer has a nice foamy head and a lightly floral hop smell mixed with the malt. The hops definitely take front stage, but you can get the smell of both. The taste had some bitterness, but not as pronounced as what you'd expect in an IPA or other pale ale. The floral sourness hits ya later into each sip, but it's very enjoyable and good for a mixed audience (i.e. a group that doesn't want a full-blown IPA, but wants a bit more than a mid-range beer). The beer was pretty smooth and had a subdued, but flavorful aftertaste. I really enjoyed the blend of hops and the style of the red. A great compromise to having an IPA or a red. Poured from a 12 fl oz bottle into a large snifter. Ruby amber color with two finger thick off-white head that fades to a small layer. Good lacing. High number of bubbles. Hazy appearance. Aroma is full of dry hopping with a certain kind of hop profile used that is distinctive. Piney, resiny and slightly floral aroma. I like it. Very suppressed malt, caramel aroma. Taste: Hop forward. Malt is quite suppressed for a semi-dry bitter finish. Lingering bitterness that is yet again distinctive. Mouth feel : Medium to slightly oily feel. High on carbonation that contributes to some astringency along with dry hopping. Drinks like an IPA just for color and little caramel . Low on alcohol but still a good ale. I like it.